Dementia has cruelly reduced my mother in law's ability to think clearly. Three years ago the doctors said she needed to go into a care home. She was becoming a risk in her own home. But the care home staff don’t seem able to help her. It's clear they haven't been trained in dementia care. Sometimes they sound exasperated, and regard her like a bad child. They call in social services, doctors and specialists, because they lack skills to cope. And that's why dementia care training is so important. It makes a difference to the lives of sufferers. With the right training you could have a huge impact on people with Alzheimer's. You'd know how to make them feel relaxed, secure and comfortable. Are you already working with people who have dementia? Are you seeking promotion in a care home? Looking for more responsibility? Or maybe you'd like to enter that all-important type of work? 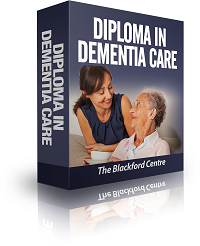 To properly care for people you need excellent training, the kind that comes with The Blackford Centre's Diploma in Dementia Care. 80% of people living in care homes have either dementia or severe memory problems. Yet 71% of care homes told to improve by the CQC have training gaps, especially in dementia care. Half of these homes were breaching the regulations that require homes to ensure a suitably trained workforce. Look at the two blue boxes below, and you'll see what I mean..
"Staff had only received basic dementia awareness training which did not fully meet the needs of people living with dementia. "When we discussed dementia care with staff, we could not identify any recognition that people living with dementia required specialist care. Management and staff were not equipped to provide for the complex needs of people with dementia." That's a terrible finding (above). It means poor quality care for the resident and their family. It's also bad for those who care for the resident, because they'll be stressed, being unable to deal with the person's changing behaviour. "The home is a specialist dementia care home, yet staff had not received training, beyond basic awareness training, in dementia, managing behaviours that challenge others, and the Mental Capacity Act 2005." The course contains a fascinating and wide range of content. A Quick Start guide, to get you started. A sturdily bound set of course modules that lie flat for ease of study. In the online edition, we provide the modules as PDFs you can download or read on the screen. 31.500 words of practical how-to text. Detailed information that shows you how to care for patients and residents more professionally and achieve better outcomes. 19 videos. Over three hours of information. Sit back and watch how to care for people with dementia. 8 tutor-marked assignments. Your assignments will be carefully marked with personal advice by an experienced tutor. They help you learn and grow. A study guide and planner that helps you organize your study. 29 self-assessment exercises. They occur throughout the course to help you get organized. They also check that you can tackle each of the topics covered. Question and Answer sheets for you to have your queries answered. 'How to Succeed in your Distance Learning Course' booklet (right). Tips and advice on how to successfully complete your course. This booklet is not available elsewhere. 'How to Write Assignments' booklet. This booklet offers useful guidance on how to prepare your assignments. It's not available elsewhere. Dementia is a devastating and progressive syndrome that gradually erodes the mental capacities of its victims. It affects memory, thinking processes, behaviour and the capacity to do ordinary tasks that most of us take for granted. So, good training in dementia care is essential to help staff, families and above all the sufferers. Perhaps you're already working with dementia patients in a care home? Or you've been thinking about doing something to help in this area? Maybe a family member has recently been diagnosed with dementia, and you want to know how you can help? You want to step up and bring relief to those families' suffering. But sometimes a little knowledge is a dangerous thing. If we don’t have the right knowledge and skills we can do more harm than good. Hence the need for training. "…Staff were not equipped to deal with some of the people that lived there and had not had training around mental health. "No training had been provided to staff around challenging behaviour or understanding mental health. "18 staff had not received training in health and safety and safeguarding …, 11 had not had training in infection control and dementia…. Understand and use the correct procedures for storing and giving out medications. Reduce the severity of difficult behaviour such as disorientation, wandering, hoarding, and aggression. Apply mental capacity requirements as required by law to ensure your resident’s wishes are respected. Use assistive technology such as personal alarms, health monitoring systems, and other modifications to reduce anxiety and other problems. - You can study the course both online and in a printed format. - You have complete freedom to study at your own pace. - The course is structured in a logical way, to make it easy to take a break when you need to. - Video. We know the importance of visual learning rather than just reading about it so we made sure that the written text is broken up with video segments. Three hours of high quality videos reinforce the in-depth written material and demonstrate advanced care techniques. - Twenty-nine self-assessment tasks ensure you understand and fully absorb the lessons of each module and prepare you for the eight tutor-marked assignments. Your tutor will provide useful feedback and is available whenever you have questions. - There's a study guide on how to succeed in distance learning, including how to get top marks in your assignments. - You can take as long as you need to complete the course; so this course is perfect for everyone who needs a flexible schedule. - And when you complete the course you will receive an attractive professional diploma to proudly display on your wall. - And theres' a money back guarantee if the course doesn't completely suit you. As a carer for dementia residents, you need some special care, as well as the sufferer, because it’s a challenging job. When you provide stability and a caring, homely environment, you make your own life easier, as well as that of the dementia sufferer. The statistics are clear: without well-trained and knowledgeable caregivers, sufferers can feel terribly isolated, alone, and fearful. Our course gives you the tools that you need to do your job, do it well, and do it with satisfaction. Completing this training will benefit your career. Care homes, the CQC and other inspection agencies are looking to lift the performance of dementia care units and care homes in general. Having a professional qualification in dementia care will make you attractive to employers and give you an advantage over other job applicants. It may also lead to promotion. Ask yourself now: “Will more up-to-date knowledge and skills make me a better carer and make my work and my life easier?” If your answer is “Yes” then you need to seriously consider tkaing this course. The Diploma gives you the perfect opportunity to learn the most advanced care techniques and the most up-to-date industry standard practices. With it, you'll be well equipped to provide the best quality of life experience for the dementia patients in your care. Our course provides up to date knowledge about the latest research, techniques, and medicines that can help reduce the severity of the symptoms and transform the lives of those sufferers and their caregivers. The Diploma is designed for the professional caregiver or anyone committed to providing the best possible care for a loved one. - You get the freedom to study anywhere in the world and in your own time. Say ‘goodbye’ forever to rigid class schedules because now you can take control of your learning and of your life. - We're accredited and registered with the UK Register of Learning Providers (UK Provider Reference Number 10009490). - Students from 83 countries studied with us in the last 12 months, includng South Africa, India,the USA and Australia. Running a care home? How this course will help you. For the care home it means better inspection reports, reduced friction among residents, reduced staff turnover, and increased satisfaction among family members, leading to increased occupancy rates. Overall that translates into lower costs and higher income. Research shows that many things that will improve the lives of people with dementia. We've taken care to ensure that our course combines the latest research and the best techniques to help you and your patients. As with every potential life changing decision we usually get back what we put in. Being open to new learning is part of transformation, of fulfilling our potential and becoming who we are really meant to be. Rest assured Blackford Centre courses are designed with your best interests in mind so you can step up and take charge of your learning and of your professional life.